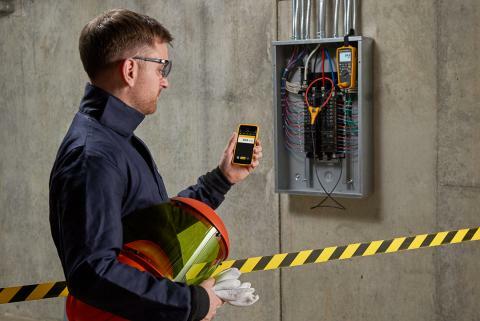 The Fluke 114, 116 and 117 Digital Multimeter (DMM) series offer several features designed to make electrical measurement easier, safer, and more reliable. This application note describes what dual impedance and voltage detection are and why it helps to have them built in to your multimeter. Older troubleshooting tools such as analog multimeters and solenoid testers generally have low impedance input circuitry around 10 kilohms or less. While these tools aren't fooled by ghost voltages, they should only be used for testing power circuits or other circuits where the low impedance will not negatively impact or alter circuit performance. With dual impedance meters, technicians can safely trouble shoot sensitive electronic or control circuits as well as circuits that may contain ghost voltages, and can more reliably determine whether voltage is present on a circuit. On the Fluke 114, 116 and 117 DMMs, the meter's regular Vac and Vdc switch positions are high impedance. Use these switch positions for most troubleshooting scenarios and especially on sensitive electronic loads. The Fluke low impedance function is called Auto-V/LoZ. Auto-V stands for automatic or volts. This feature automatically, determines whether the measured signal is ac voltage or dc voltage, selects the correct function and range, and displays the correct information. LoZ stands for Low Impedance (Z). This feature presents a low impedance input to the circuit under test. This reduces the possibility of false readings due to ghost voltages and improves accuracy when testing to determine absence or presence of voltage. Use the Auto-V/LoZ switch position on the DMM when readings are suspect (ghost voltages may be present) or when testing for the presence of voltage. 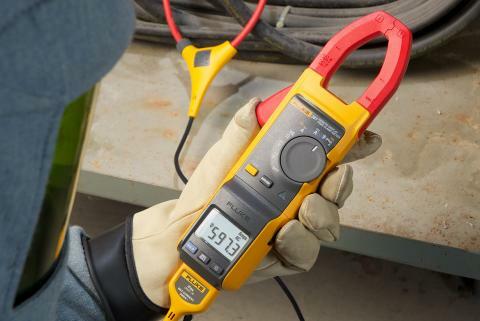 Most digital multimeters available today have an input impedance that's high enough to show the capacitively coupled voltage, giving a false impression of a live conductor. The meter is actually measuring voltage coupled into the disconnected conductor. However, these voltages, at times, can be 80-85% of what the "hard" voltage should be. If not recognized as a ghost voltage, additional time, effort and money will be lost troubleshooting circuit problems. 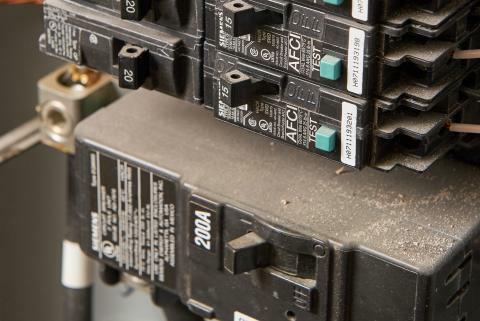 The most common places to encounter ghost voltages are blown fuses in distribution panels, unused cable runs or electrical wiring in existing conduit, open ground or neutral on a 120 V branch circuit or in card cages where 120 V control circuits are used to control assembly line or conveyor functions. Some amount of ghost voltage can be coupled from the hot side to the open side across the blown fuse. When facilities or buildings are built and wired, it's very common for electricians to pull extra wire through the conduit for future use. These wires are typically left unconnected until needed, but are subject to capacitive coupling. In the case of the control circuits, these circuits are typically located adjacent to unused control lines, thereby creating a potential for a ghost voltage measurement. With a dual impedance meter, select the Auto-V/LoZ function. This function has a low input impedance on the order of three kilohms. When the leads are placed on an open circuit that contains a ghost voltage, the low input impedance will cause the ghost voltage to dissipate and the meter will display a reading near zero volts indicating no voltage present. When the leads are placed on a live circuit, however, the input senses the presence of "hard" voltage and then displays the actual voltage present. 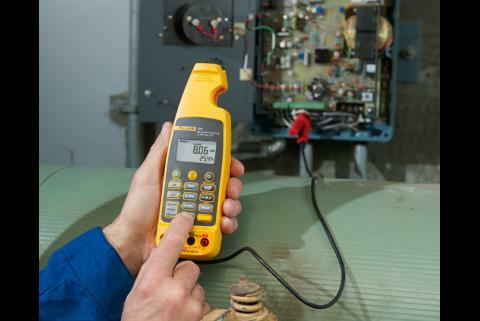 The Fluke 117 DMM also includes VoltAlert™, a built in non contact voltage detector. Located on the top of the meter above the LCD display, the sensing circuit detects the presence of ac voltage and produces an audible tone and activates a red LED indicator light, located on the top center of the LCD display. The detector offers two sensitivity settings for ac voltage detection. The "Lo" setting can be used on flush mounted wall sockets, power strips, flush mounted industrial outlets and various power cords. The "Hi" sensitivity setting allows for ac voltage detection on other styles of recessed power connectors or sockets where the actual ac voltage is recessed within the connector itself. The VoltAlert™ detector works in bare wire applications with voltages as low as 24 V in the "Hi" setting. This feature allows technicians to quickly determine whether a panel, cabinet, or machine is properly grounded. If ac voltage is detected, the troubleshooter should then use the Auto-V/LoZ function to determine if the detected voltage is ghost or hard before beginning work. 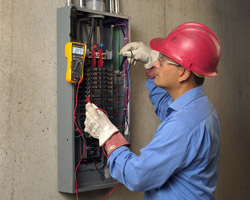 Given the variety and complexity of measurement and testing requirements found in most facilities today, a meter with a dual impedance input offers the troubleshooter or technician more flexibility to cover applications or measurement needs ranging from basic voltage testing to troubleshooting sensitive electronic circuits. In addition, having the voltage detector helps increase efficiency and adds an additional safety check before beginning work in cabinets or other locations where voltage may be present.